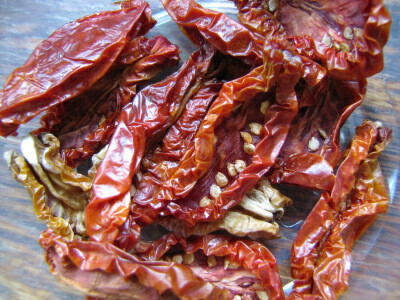 I posted earlier about Hollywood Sun-dried Tomatoes --- how much we love them, and how to dry the tomatoes in preparation for the main event. Now it's time for the fun part --- assembling the concoction. This recipe makes about 1 cup of Hollywood Sun-dried Tomatoes. 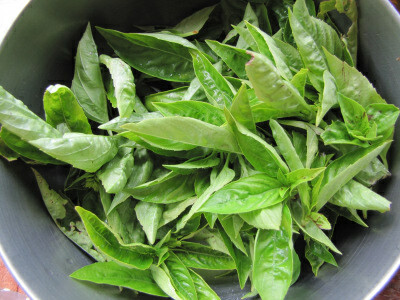 Step 2: Add about a cup of loosely packed basil leaves to the food processor. Blend again. 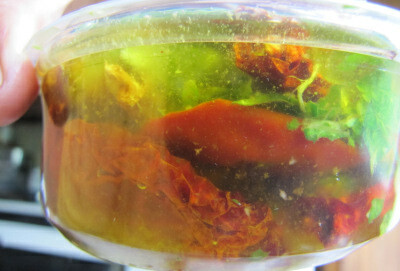 Step 3: Line the bottom of your container with one layer of sun-dried tomatoes. Step 4: Spoon on enough of your garlic, basil, and oil mixture to liberally cover the tomatoes. Step 5: Lay down another layer of tomatoes, another layer of goop, another layer of tomatoes, and so forth, until you reach the top of your container. Step 6: Pour olive oil over your tomatoes until the oil completely fills the container, as in the photo below. Step 7: Put on the lid and let your concoction marinate in the fridge for a few days. The tomatoes will plump back out and become infused with the herb flavors. Alternate Step 7: We consider Hollywood Sun-dried Tomatoes to be a winter treat, so we toss them in the freezer immediately after step 6. After they've frozen, then thawed back out in the fridge months later, the flavors have blended perfectly. How do we eat the Hollywood Sun-dried Tomatoes? Mark scarfs them down like potato chips, but I like to save some for more serious cooking. A few of these tomatoes act very much like a couple of slices of bacon in a dish --- instant crowd-pleaser. Try them in egg salad, mixed with pesto over pasta, or as a pizza topping. I usually throw the tomatoes and a bit of their oil back in the food processor and whir them up into little bits to make the taste go further, but you can put whole tomatoes straight onto your winter sandwiches. Our movie star neighbor told me that the only flaw in his recipe is that it requires so much oil, but I don't consider that a problem. Once you pull the tomatoes out of the juices, you're left with flavored oil that will spice up just about any dish. If you can't think of any other way to use it, try brushing the oil mixture over a piece of stale bread and toasting it for instant, delicious garlic bread. The real problem with these tomatoes, in my opinion, is that there's never enough of them. This week's bowlful of Martino's and Yellow romas shrunk down into two scant cups of dehydrated beauties --- just enough for birthday celebrations for two. Our homemade chicken waterer is perfect in coops or tractors. Oh my, that concoction looks absolutely delectable - thank you so much for sharing! Sadly, it's a little too late for us to make it this year (unless we want to buy some tomatoes sigh), but I'm definitely bookmarking this to try next year! And I agree that flavored olive oil comes in handy in lots and lots of dishes - I can't imagine why your neighbor would be upset about the amount of oil needed; it's not like you're going to throw the oil away once the tomatoes are gone! I know what you mean about it being too late in the year to make this. I'm wishing now that I'd started drying tomatoes as soon as the first ones ripened, since the sun is now on the decline and so are our tomatoes. I think of this as candy, though, so I figured I should be good and freeze all of our required sauces and soups before moving on to snacks. I think that next year I'm going to throw caution to the winds and start drying tomatoes from day 1! Never store garlic in oil at room temperature. Its low acidity and absence of oxygen provides a perfect medium to grow spores of Clostridium botulinum which cause botulism. The biggest problem is that there is no easy way to detect that this has happened. According to wikipedia, freezing alone is apparently not enough to halt the spores' development. 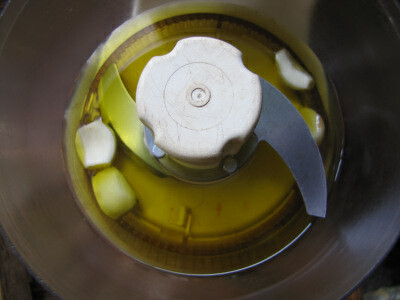 The garlic needs to be acidified as well, or the mixture should be cooked in a pressure cooker for 3 minutes at 121 °C. 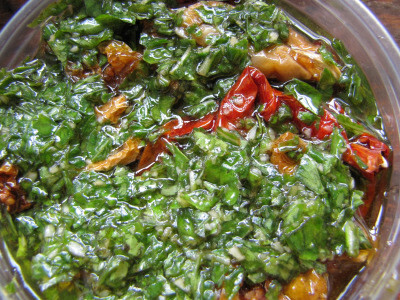 You should not keep garlic oil in the fridge for longer than a couple of days. Personally, I stopped making garlic oil after I became aware of this. Botulism is definitely one of those things you don't want to mess with. We always stick to the fridge with our Hollywood sun-dried tomatoes. Mmmm, so delicious. Thank you. Thanks for posting this recipe and keeping it archived. I finally made some from my excess cherry tomatoes. You're darn right it doesn't last in the fridge. My man was scarfing it down with crackers on the very first night. Today, I minced some and threw it in a pasta salad. This is the best kind of "convenience food" to have in the freezer or fridge.